I’m a terrible blogger. Two weeks (at least) since my last post? Slap slap! My usual excuse that I’ve been sooooo busy really doesn’t cut it this time. I was busy. I am busy. But then again, who isn’t? Anyway, lots of things going on that I will have to fill you in on. I thought of this blog a few weeks back. It was a Sunday evening and we were relaxing in front of the TV. Louie was peaceful beside me. I was knitting and Eric was doing Eric like things which I usually don’t pay mind to. I thought about how nice it would be to have a little family; one with a tiny human being in it. We have a family, I know that. It’s just, I wanted, at that moment, something to snuggle or feed or burp. Something to take care of. At first I couldn’t quite figure out what the feeling was. And then I realized it was loneliness. Or maybe a mixture of lonely and sad. I don’t feel this way very often. Just in the quiet moments when it can sneak in and take me by surprise. I usually am filled with busy things such as work and clubs and reading or knitting or fill in the blank. When this feeling comes across I stuff it down a bit. I consider the people who are sick with cancer. The family who doesn’t have a place to live. The animal that was hurt at the hands of an owner who they had nothing but unconditional love for. That’s when I feel grateful this is all we have to deal with. I’ve talked about this feeling of gratefulness before and I swear it is a Godsend. The ability to be grateful puts things into perspective for me. But enough of the sad stuff for now! I have to let you know about a newfound passion for fun in the way of motorcycling. Yes, I know. Motorcycles are dangerous. People get into accidents and get hurt or sometimes die. The same thing happens when folks drive a car or ride a bicycle or take the train to work. I mean, take a look at that lady in Chicago who recently got hit by the mirror of a megabus. How random! It’s all relative. After taking a motorcycle riding class last year I’ve been itching to try it on my own. Eric has encouraged me to get on my neighbor’s bike for some time now. As a flight attendant she is rarely home. 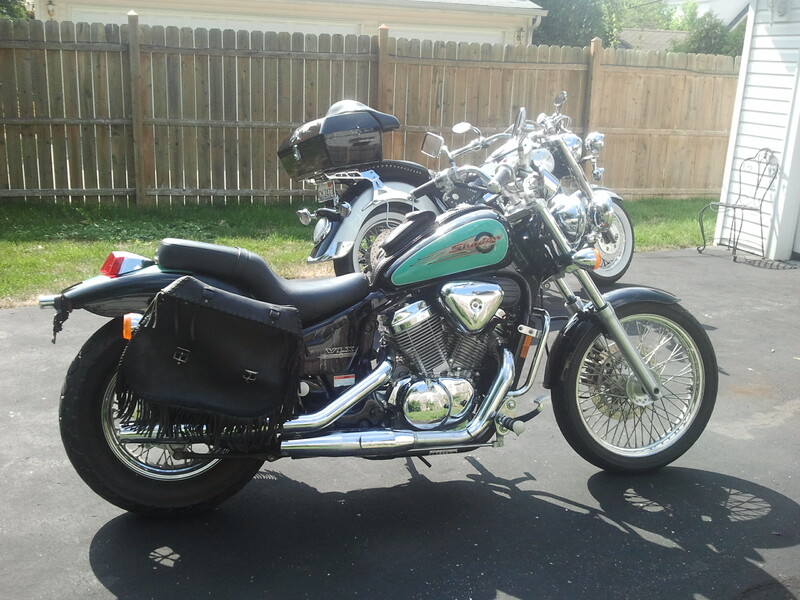 She offered up her 600cc Honda Shadow as it sits in the garage most of the time. She gave me the thumbs up to take her out and I haven’t looked back. I had Eric take me to parking lots on the weekends so I could practice all the skills I’d learned in the class. Parking lots, being relatively safe, gave me the confidence to want to try more. Yet, I hesitated. Could I really do this? The third time in the lot Eric looked at me and said, “You’re never going to learn to ride if you don’t get out on the street and just do it”. Scared out of my wits, I agreed and haven’t looked back since. Is this how it is with parenting? I feel like I have to justify this purchase. After all, the money we spent could have paid for another IUI treatment. I just wanted something that I could feel good about. And I do. I am having a ton of fun and it makes me happy. That is what life is about anyway. Isn’t she pretty? The next time you see it she’ll have a beautiful new paint job! The other cool news I wanted to tell you about was the birth of the Davis twins. I mentioned them in the last post. Mom and I will be seeing them in September at the Birdies for Babies event. I am wrapping up the press release on that soon and will post a link once it is published. I’m not in the mood to write tonight but I feel I need to give some updates. The last few weeks have been filled with work meetings, spinning, laundry and house cleaning. I am neglecting the dog and haven’t stocked the refrigerator since almost two weeks ago. It’s a vicious cycle. Over the past few weeks Eric and I have talked extensively about our decision to move forward with IVF. It is a hard decision to make but we have opted to postpone the treatments in order to pay down current debt. A few people told me to just pull out all the stops and find a way to pay for it. The problem is, there are no guarantees. If we paid the money and didn’t come home with a baby, we’d be devastated and broke. Does this make it sound like I don’t really want a baby? Truth be told, I have never had that strong urge to have children like some people have. Now that I’ve gotten older my confidence in my ability to raise a child has grown and maybe with that the desire to have one. I just wish I was strong one way or the other. Either I don’t or I do. Yes or no. Black or white. But things are not so black and white in this case. There are benefits to being childless; no doubt about that. But we also wonder what kind of little being the two of us would make together. What would they look like? What kind of personality would they have? Would they be healthy and happy? Part of the talks we’ve had also include adoption. I would be open to this but Eric has hesitated. He’d rather exhaust all options with treatment to see if we can have a natural child rather than adopt. These are the dilemmas we discuss wrapped up under the covers when we can’t get to sleep at night. We talk during commercial breaks or over coffee on a weekend. We communicate that which is important to each of us. Compassion and understanding are qualities we both appreciate. I am not sure what the future holds for us in terms of children. I just know that we are living each day at a time and are doing the best we can with what we have. I am pleased to say I’ve become more involved in Birdies for Babies. I’ll be interviewing the couple selected as this year’s recipients of the golf outing funds. I will recap that interview on Tuesday. A friend asked me today if it was hard to be happy for this couple. I told her I was thrilled for them. I harbor no hard feelings for anyone who has been blessed with such a gift. Anger serves no purpose as far as I can see. I’m just glad to be a part of such a special journey – even though I have not met them yet!